I have a special middle of the week guest and giveaway! Back in the late 80's I happened to be perusing the shelves at my local christian book store and stumbled up a new novel - This Present Darkness by Frank Peretti. The premise of angels and demons battling over the possession of the inhabitants of a small town intrigued me. Have you ever read a novel that was so visually stunning, it creates a visceral reaction that sticks with you forever. Frank Peretti knows how to verbally paint a picture and has continued to do so in all his novels from his very first This Present Darkness to Tilly to Visitation. So when he released his latest book after a long seven years, I immediately ordered it and read it. Illusions is one of those stories that makes you hold your breath wondering what's going to happen next. So imagine my surprise and delight when I received an email asking if I wanted to be part of the ASK FRANK Blog tour. I am the last stop on the tour of 9 bloggers made up of nine pastors, authors and book reviewers who had the pleasure of asking Frank all about Illusions, his writing process, his ideas behind the story and more. Be sure to check out the other chats with Frank. Can you tell us about the story behind Illusion? As with all of my stories, there is no single source or spark of inspiration. Every story comes together like the pieces of a jigsaw puzzle spilled out on a table. Lots of little ideas float around looking for partners, and then they connect, and then they find other pieces, and ideas lead to other ideas, and before long I start to see a story appearing. I suppose the love story in Illusion reflects my own marriage, my own love story in how love can endure, deepen, and take on such a transcendent meaning over time. I guess the love that Barbara and I have for each other can only be expressed by writing a story. Why did you choose to use magic and Illusion as a framework for this book? Obviously, magic would be interesting and highly visual, and would also afford plenty of opportunity for mystery. Secondly, Mandy’s sudden, unexplainable ability to create and perform such mysterious effects works right into the whole inter-dimensional, time bending element, the “sci-fi bad guy” intrigue of the story. What is the main idea you want people to take home after they read Illusion? I guess you’re asking me, what is the story’s central theme? I would call this story a celebration, a depiction of love, marriage, honor, and commitment such as God purposed them to be, and on a deeper level, a parable about Christ’s love for his bride and how his bride longs to be with Him in intimate relationship. And guys, this is not a “chick” book. It’s a story for everybody. We could use a few more Mandy's with tenacious devotion to their man and a few more Danes who give themselves for their woman as Christ gave Himself for His church. As always, I’ll speak from my present day point of reference and say that Mandy (from Illusion) is my favorite character, and that is because she is, in the final view, a true hero and bearer of faith, hope, and love. That is the million dollar question right now. Barbara and I both feel that the Lord is bringing about a change in our lives, a new season, but He has so far withheld any details. I do anticipate writing some more novels since that seems to be what I do best, and I’m sure that these novels will arise from whatever it is the Lord is working in our lives right now. Thank you, Mr. Peretti for joining us today and I for one look forward to reading your future novels. I am giving away one copy of Illusions and the giveaway is open to readers of both My Two Blessings and Read 52 Books in 52 Weeks through April 7th (U.S. residents only.) Please leave a comment letting me know which Frank Peretti book is your favorite along with your email address. 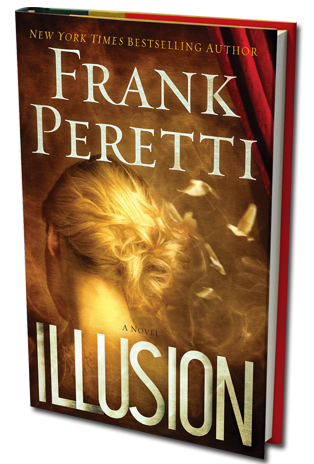 Be sure to check out Frank's Facebook page tonight April 4th (9 p.m. eastern) and join in The Last Hurrah Party where he will be giving away more copies of Illusion. Thank you to Howard Books (imprint of Simon and Schuster) for providing me with a giveaway copy, Mark of C. Grant and Company for organizing the tour, and Frank Peretti for writing such wonderful characters and stories. This is a new author for me and I'm wondering why I haven't heard of him before. I've got Illusion on hold at my library now and am really looking forward to reading it! Thanks for sharing this, Robin. I read "This Present Darkness" years ago and loved it. This gives me the desire to get it out and read it again. I look forward to this new book. I remember my Dad reading This Present Darkness, but I have never read any of Mr. Peretti's books myself. I'm adding Illusions to my to-read list! I think my favorite book was this present darkness. Well, that series really. It really made me think and doubly look over passages on spiritual warfare-it made me know & understand just how real they are. I loved the Oath and Monster, but I Love everything he's written! This is the first I have heard of this author. By what I have read about this author this should be a great book. My favorite was House. :) Loved it. Enjoyed Piercing the Darkness and This Present Darkness as well. I've loved Peretti in the past and his wife's book: Season's of My Heart was especially meaningful to me during a difficult period. I'll be sure to check out Illusions! Thanks for a great interview, Robin!! Read TPDarkness when I was living alone in a house out in the country in 1988. I was a little scared until a friend said, "Carol, just remember, you know who wins!"